There is always some executive who spills the beans and the news is out like wildfire. 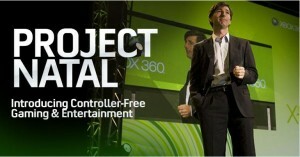 In a recent interview with GamertagRadio, the Saudi marketing manager for Microsoft, Mr. Syed Bilal Tariq reportedly spilled the beans on the launch month of Project Natal, the motion sensing camera technology for the Xbox 360. Tariq also revealed that the launch will be global and that it will be hitting the stores just in time for the holiday season, a timing perfect to bump up the sales! Tariq also indicated that the launch date will be confirmed somewhere in June and in time for the third quarter. After the success of the Nintendo Wii, Microsoft and sony are coming in with their own motion sensing technologies. While Project Natal is the one where motion is sensed with the help of cameras. Is this something like a gimmic, an experienced marketting manager is unlikely to “spill the beans” and go on to give more details like “worldwide release” etc. This is an easy way to get websites and the market hyped up. Now that they “leaked” this information, you would think twice about buying that ps3 or the nintendo you wanted and wait for Xbox until october. Do you agree? Have a look at the following video to have an idea of what Project Natal can do for you! Next Lenovo IdeaPad U160 Notebook is out!